Every month I personally review a large number of resumes and LinkedIn profiles so I’m able to provide insight into how one resume or profile compares to another job seeker and what recruiters are seeking. We’ve all been told that looks don’t matter as much as substance. But, in the case of your resume, this just isn’t true. Often, when I review resumes I find the design to be visually uneven. 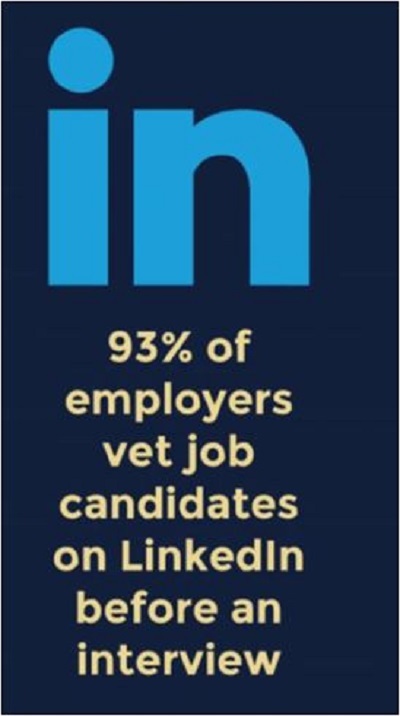 The appearance may not be polished, and it doesn’t say ‘high potential.’ Your resume is your marketing tool. It’s the first impression a potential employer has of you. Use bullets to emphasize (but not too many as it’s difficult to zero in on the most important information). The size and type of bullet are also important. Too large is not visually appealing and a distraction. Make sure the additional pages have contact information on them. If your resume gets printed and a page is separated, the hiring manager can then still be able to identify you. Brevity is important of course but if some phrase or statement is too short to convey something new or interesting about you – it should be removed or rewritten. Having a ‘Reference Available’ section is not necessary. Employers typically assume you’ll have this on hand during interviews. A career summary should be present. Get off on the right foot by giving the ‘whole picture’ of who you are as a professional. This is a key component to compel the hiring manager to keep reading. Clearly define yourself as a professional from the start before delving deeper into your work experiences. The wording of your resume can either convey you as a ‘doer’, or an ‘achiever.’ When job descriptions read as task-based opposed to results-based – it only tells what you did and not what you achieved. Employers want to see achievement. Think quantitative results when available ($,%, Increased….Decreased). Passive Language/Doing: Negotiated contract with vendors. Action Language/Achieving: Decreased administrative costs by 30% by negotiating pricing and fees with vendors. The size of your resume from a digital standpoint is just as important as the content and presentation. For example, a resume at 143kb is quite large. Trimming down pieces of your resume will decrease the size; yet, also by standardize fonts and formatting. Great amounts of varying fonts, division lines, graphics etc. can make a resume unusually large and simply does not pass through some digital systems (especially the older ones). Also, a Microsoft Word resume document is preferred as a PDF saved resume is not easily read by digital scanners. 4. DOES IT PASS THE RESUME SCANNING SOFTWARE LITMUS TEST? 90%+ of all Hiring Managers use a resume scanning software to filter candidates for the application pool. Your resume is passed through and the software uses filters to determine the real talent from the hundreds, sometimes thousands, of candidates that apply for a single open position. If Stephanie is seeking a position in Human Resources – her resume is looking good. Therefore, it is so important to tailor the resume to the position in which seeking and not only past experiences; hence, generalized. Make sense? Applicant Tracking Systems (ATS) automatically designate a Best Fit based on your experience level and the kinds of keywords spread throughout your resume. The ATS will also assign a weighted score to Key Skills and Competencies from your resume to paint a picture of who you are as a potential employee. So, TOP SKILLS and Other Core Competencies should be clearly stated. The perspective of another brings to your personal pitch a neutral view of what your resume conveys opposed to what you believe it conveys. The benefits of ‘an outsider’ can help identify and optimize the success of your new job search or career change. It may seem daunting but a regular review of every word or sentence is a good idea too. You may not see awkward phrases and grammar errors – you and the perspective of another working together can bring about a winning resume and get you off to a good start in 2018. Read just a few testimonials from our satisfied clients…we have 100’s and are working to update our site daily.